The field of marketing is very essential for a product, service, or company to be known by the market that it wants to penetrate. There are many marketing activities, tools, and platforms that are being used nowadays to assure that the company can keep up with its competitors. In this modern age, being visible in mostly any medium possible can actually translate to actual sales. 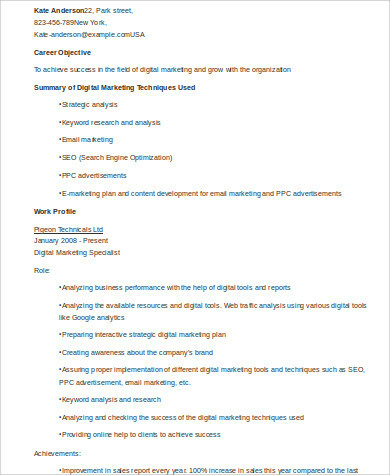 There are many things that a well-planner marketing activity can provide to the company. This is the reason why marketing employees are screened well so the company can be sure that they are hiring the right people for the job that is very important for the company’s marketing operations. 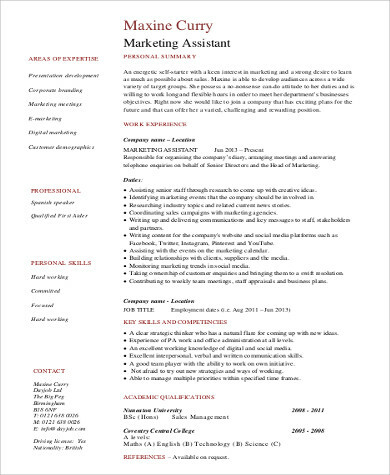 We can provide you with marketing resume format samples and other Sample Resumes should you want to apply for a marketing post and other job positions. 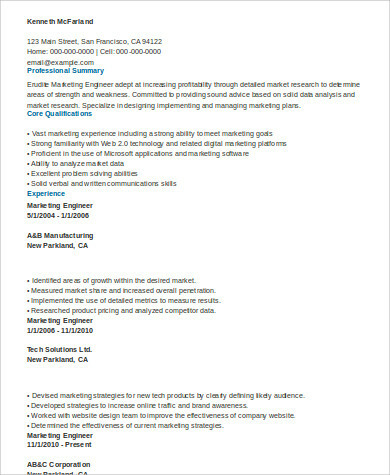 The field of marketing requires specific technical skills that are needed for marketing job or project to be done. 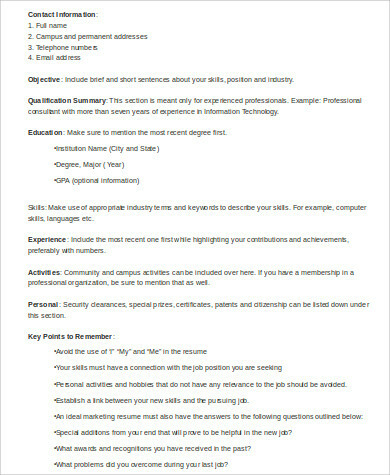 Be sure that you are aware of your skills that can be used in the field of marketing and highlight them in your resume. 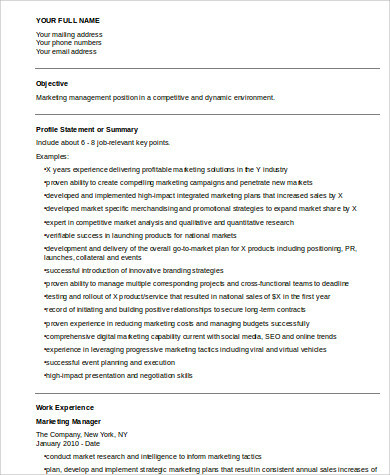 If you already have marketing experiences, it is mostly suggested that you put all the functions that you have already gone through, especially those that are related to the nature of the marketing job that you are applying for. 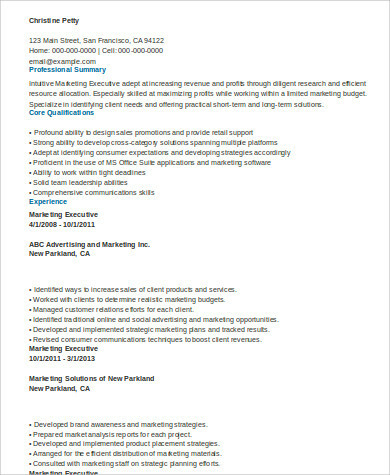 More than your expertise and skills, a great personality is needed for every marketing job. A part of the work is for you to talk to a lot of people in different scenarios. You may be assigned to present the products and services of the company so you need to make sure that you can communicate professionally while maintaining warmth and connection the the stakeholders of the business. 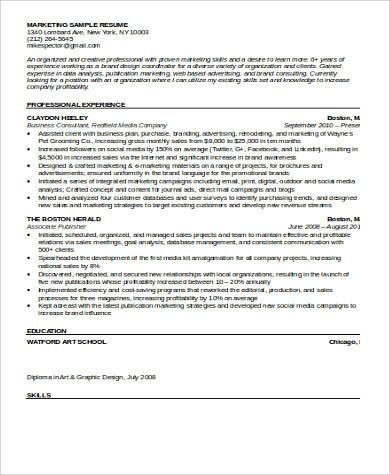 Other than our marketing resume format samples, you may also download our Sample Marketing Resumes and Sample MBA Resumes. 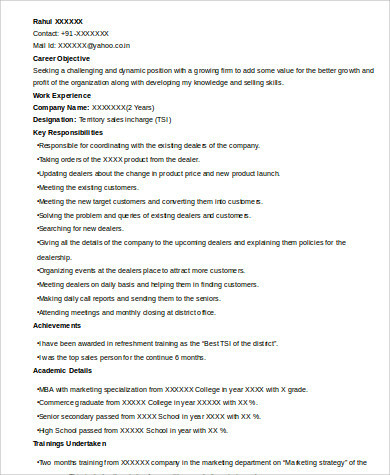 The creation of the marketing tools and items used by a company is under the supervision of the marketing department. Marketing employees also need to attend trade events, sales expos, and convention to market the product and service offerings of the company. Marketing presentations may also be done by employees in the marketing department, especially those that concern employment and the acquisition of new markets and client bases. Offline marketing is also practiced, which includes events to be hosted by the company, creation of marketing brochures, marketing programs involving the community, and many others. Marketing can also be done only through facilitating the website, online pages, social media accounts, and online partnerships and advertisements of the company to maintain the online reputation of the business. 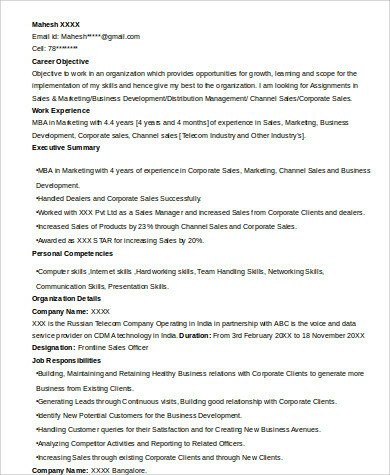 Aside from our marketing resume format samples, you may also be interested to browse through our Professional Resume Samples for additional references.